If I had to pick one guy, outside of the immediate circle of musicians or lyricists, who was responsible for the success of the Grateful Dead, it would be Augustus Owsley Stanley III. If you were a member of the GD circle, you knew him as Bear. If you bought LSD anywhere on the west coast in the late 1960s or early 1970s, you knew him simply as Owsley, the guy who cooked millions of doses, before and after the drug was deemed to be illegal in 1966. Bear was killed on Sunday, in a car accident near his home in Australia. Bear’s underground industry helped him finance the band, which he first saw at one of the Bay Area Acid Test shows. He bought gear, he paid for their living expenses and allowed them the time to develop from something of a novelty to the biggest band in the San Francisco area. He even took them in while he lived in Los Angeles for a spell, feeding the band’s members only steak — he thought vegetables were toxic and carbohydrates caused diabetes — kept them stoned nearly all the time, because they all lived in the lab where he was cooking the substance that paid for the band’s expenses. He observed early on that the band’s live harmonies were horrible; he actually went as far as to suggest that they play only songs that didn’t require background vocals. The guys didn’t go for that, so Bear did the next best thing — he upgraded their monitors and sound system, a process that continued with him until he designed the Wall of Sound, a monstrous system that could produce crystal-clear sound at a staggering decibel level. For those two-and-a-half years, the band had to use two Walls of Sound, so one could jump ahead to the next venue while the band used the other for the current show. It was a sonic success but a business nightmare — the expenses associated with hauling two of those things around the country nearly bankrupted the band and was a big factor in the hiatus that started in 1974. He taught me to take myself and my interests out of the picture and work with the subject under consideration so that the best deductions or conclusions are made. I guess this means working from the point of view of the higher self, though that term never came up; it was always just assumed…Most important was the approach he taught me: Always be open and engaging – always critical and questioning, but not negatively so much as playfully. There are pictures of Bear available through the magic of Google, and I’m not going to post any of them here. Bear preferred to be a behind-the-scenes guy, and that’s something I’ll respect here. 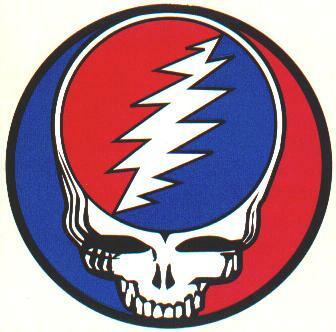 Instead, you get a Stealie, which Bear helped design as a stencil to easily identify the band’s gear. It’s a pretty good symbol of the impact he had on the band. He needed something to make his job and that of the crew a little easier; what he came up with because the best-recognized icon for an iconic band. Thanks, Bear, for that and everything else. 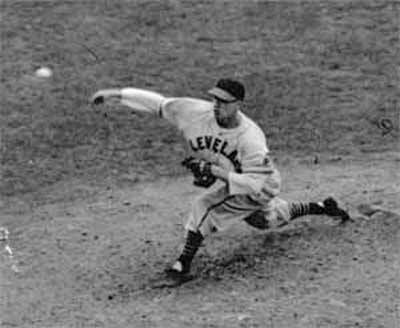 There was a time that I didn’t really know that the Cleveland Indians existed. But I knew about the Cincinnati Reds, and I knew about the white-haired guy who guided the Reds through most of the 1970s. 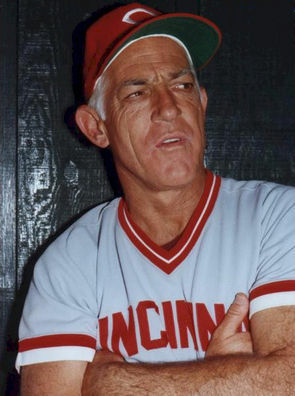 I was a huge baseball fan back then, an easy thing for an Ohio kid when the team you listened to on the radio every day and every night had Bench and Perez and Rose and Foster and Concepcion and Geronimo and Griffey and Morgan and Gullett and Borbon … and Sparky Anderson, their manager. I know there were playoff runs early in the decade, including a series loss to Baltimore in 1970s, but my memories really start with the 1975 season, when Sparky moved Pete Rose from left field to first base early in the season to make room for George Foster — who proceeded to hit something like 25 home runs and bat .300 for the remainder of the year, adding even more power to an already insanely talented offense. My memories of the 1975 series are so solid because I was allowed to stay up to watch the games — that wasn’t the chore it usually is these days, but still, Game Six, won by that damn Carlton Fisk home run, went long (11 innings? 12?). But I got to see every pitch of what might have been the best series ever, won by what might have been the best team ever. The Reds swept the Yankees the following year, and then I gave up on baseball for a while; during that offseason, much of the team was shipped out, and my 10-year-old brain couldn’t comprehend that the business side of baseball might somehow overrule the notion that HELLO, YOU’RE UNLOADING THE BEST TEAM EVER. Of course, through the miracle of cable television, I discovered the Indians a few years later, and by then Sparky had been the manager of the divisional rivals in Detriot for a while. It was easy to hate the Tigers — there’s that whole Michigan thing — but I could never hate Sparky. He helped give me some of my favorite memories of my childhood, and for that, I will always be grateful. 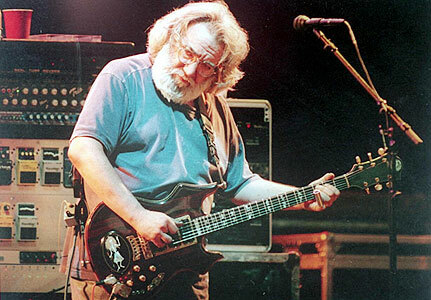 But the music — whether we’re talking about the steady stream of old stuff the band continues to release or tours by Furthur, Ratdog, Phil, the Rhythm Devils, etc. — is alive and well. No matter what my Pittsburgh friends think — or would have liked to see — the state of Ohio failed to burn down after the departure of a basketball player last week. This departure, however, is a pretty big deal. And a much more important reason to be upset. Thanks, Harvey, for sharing your life with us and reminding us of the depth, humor and joy we can all find in our common, everyday lives. When I was a kid, my family’s evening routine was pretty simple. It revolved around two things: dinner and the CBS Evening News. My folks were pretty strict about television and the dinner table — generally the rule was once the food was ready, the TV had to be turned off. But once my sister and me were old enough, the news was an exception. And by “the news,” I’m talking about Walter Cronkite. Cronkite told my parents the news when John Kennedy died in Dallas. He was the narrator when, 40 years ago, Apollo 11 landed on the moon, something I imagine I watched, but don’t recall. I do remember Cronkite explaining the Watergate hearings, a seemingly endless process to a 7-year-old boy. I remember watching him just about every night. And I remember at some point, in the late 1970s, and starting to think about the news business, because I had been watching him for my entire life. 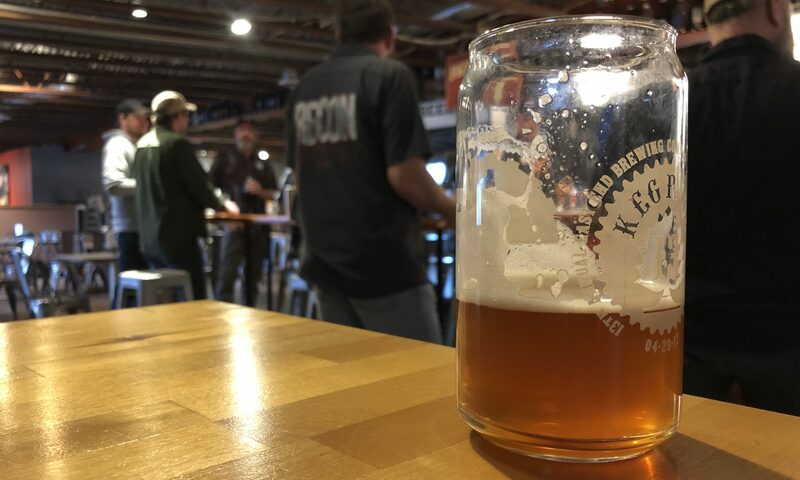 I first thought about broadcast journalism, even to the point of spending a day at one of the local stations in Columbus — the CBS affiliate, naturally — because that’s what I wanted to do. I discovered during high school that I could write pretty well, and veered away from the broadcast side of the business. But I never could shake the idea that the news was important, and that being in a position to relate and explain what was going on in the world — whether on a nationally televised newscast or in a 50,000-circulation newspaper — was a noble and worthwhile way to spend my professional life. 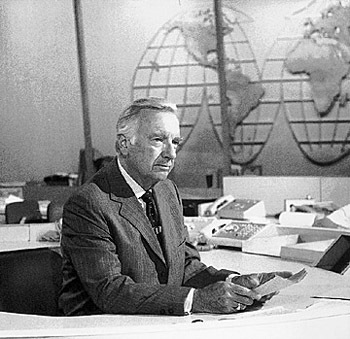 It might be a stretch to say I owe my career to Cronkite, but there is no question I started thinking about a career in journalism while watching him at the dinner table, night after night, for the first 15 years of my life.